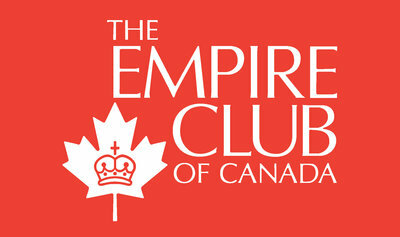 Some references to past speeches at the Empire Club, and the founding of the Club. Anticipating and responding to the changing risk environment at the heart of Lloyd’s. A focus on helping the business community understand and respond to today’s risks. Some figures from Canada. Lloyd’s as a very significant provider of insurance for terrorism risks in Canada and for Canadian interests abroad. Why Lloyd’s believes that instability is an issue of rising importance for 21st-century business leaders. Sharing thoughts on practical action business can take to manage and mitigate the risks. How business is as much at risk as government. Some illustrative facts and history. Changes to Canada’s risk profile. The danger of complacency. Incorrect decisions being made and why. The wider issue. A review of major risks. Why to invest in IT security. The real threat of terrorism. What the CSIS says. Public-private partnerships. Canada’s lack of a terrorism pool in place. The need for long-term thinking. The need for business to be part of the solution. What the corporate sector can do. Some concluding thoughts. Barbara Aarsteinsen Editor, Canadian Insurance Magazine, Stone & Cox Ltd.
Johnnie-Mike Irving: Managing Director, Financial and Commercial, TELUS Business Solutions. Lloyd’s of London has a long and colourful history, beginning in the late 1600s. It originally served sailors, merchants and shipowners who gathered in Edward Lloyd’s coffeehouse in London, England. Contrary to what many people think, Lloyd’s is not an insurance company but is an insurance market of members. It is the oldest continuously active insurance marketplace in the world. A century or so after its establishment, the members of the insurance arrangement moved to the Royal Exchange as the Society of Lloyd’s. One of Lloyd’s original sources of revenue was the insurance of ships involved in slave trading, as the danger involved in the slave trade meant that insurance was a major concern. When the exchange burned down in 1838, many of Lloyd’s early records were lost. Later legislation passed in the British Parliament gave the business a sound legal footing. Although Lloyd’s has a complex structure, most people probably associate it with the diverse types of insurance that Lloyd’s has been involved in over the years, particularly some unusual policies it has written such as insuring Jimmy Durante’s nose, Celine Dion’s vocal chords, Keith Richard’s fingers, insuring silent film comedian Ben Turpin’s eyes against uncrossing, and insuring the legs of Betty Grable, Brooke Shields and Tina Turner. Lord Peter Levene has been Lloyd’s chairman since November, 2002. Prior to that, he spent 20 years in the defence industry, and was then asked to take on the Permanent Secretary post of Chief of Defence procurement in the Ministry of Defence. He held that post for six years, after which he held a number of other government positions including serving as Adviser to the Prime Minister on Efficiency and Effectiveness from 1992 to 1997. He was also Chairman of the Docklands Light Railway and Chairman and CEO of Canary Wharf Limited. In addition to being Chairman of Lloyd’s, he is presently Chairman of General Dynamics UK Limited and a member of the Board of TOTAL SA, China Construction Bank and Haymarket Group. Lord Levene is an alderman of the City of London and served as lord mayor for the year 1998–1999. He received a knighthood in 1989 and became a life peer in 1997, and sits in the House of Lords as a crossbencher. Please join me in welcoming Lord Peter Levene. Good afternoon. I am delighted to be back here in Toronto at the Empire Club, although I admit I am always slightly awed to be speaking at a forum that has hosted every Canadian prime minister and Winston Churchill! “Empire” sounds rather an incongruous word today. However, I understand that the reason for this club’s foundation, just over a century ago, was the perception of its early members that there was a crisis at hand. There had been a sudden and widespread turning against the English in a way that seemed to pose a serious threat to Canada’s future as a loyal participant in the British Empire. One hundred and three years on, instability continues to present a common challenge, which we need to tackle together. As the world’s leading specialist insurance market, anticipating and responding to the changing risk environment lies at the heart of what we do at Lloyd’s. As insurers of the world’s leading companies, our focus at Lloyd’s is on helping the business community to understand and respond to today’s risks. Here in Canada we represent your nation’s seventh-largest insurer, providing coverage for more than three-quarters of your Fortune 500-listed companies. Working with the Economist Intelligence Unit earlier this year, we conducted research with global business leaders, and they told us that they believe they are operating in an increasingly dangerous world. In particular, they are spending more management time considering the impact of terrorism and political violence on their operations. Right now, Lloyd’s is a very significant provider of insurance for terrorism risks in Canada, and we are also at the forefront in providing terrorism coverage for Canadian interests abroad. The real estate, hotel and transportation sectors are amongst those we cover, and the 2010 Winter Olympics is already buying terrorism coverage from Lloyd’s. So today, drawing on our own experience in the U.K., Canada and around the world, I would like to explain why Lloyd’s believes that instability is an issue of rising importance for 21st-century business leaders and share our thoughts on practical action business can take to manage and mitigate the risks. Business is as much at risk as government Let me start by explaining that in our research the majority of global business leaders concluded that business is as much at risk as government from terrorism and political violence. It’s a fact that about 20 per cent of international terrorist attacks are directed against business, which means between 150 to 200 such attacks on business around the world each year. In the aftermath of 9/11, close to 200,000 jobs were destroyed or at least temporarily relocated out of New York City as lower Manhattan lost about 30 per cent of its office space. And in addition to 9/11, nearly 2,000 people have died in the last decade in terrorist attacks on business worldwide. Canada’s risk profile has changed in recent years and while no stranger to terrorism, intelligence suggests that its role is shifting from a hub for fundraising and planning attacks outside the nation—for example in the U.S.—to a credible target in its own right. We are told that, by this year, there were thought to be some 60 groups operating within Canada’s borders that support an extremist jihadi ideology. Certainly, your intelligence services, CSIS, says that there is a “direct threat” to Canada and Canadian interests from al Qaeda and related groups. Canadian urban centres have thankfully so far been spared the likes of the attacks experienced in New York, London, Madrid, Nairobi, Jakarta and other cities around the world. By all accounts, Canada’s domestic security services have done a first-class job. But that should not lead to complacency. Today’s global businesses are spending increasing amounts of time discussing terrorism-associated risks at board level. But only one in three business leaders believe their companies actually have a strong understanding of these risks. The decisions, which business leaders are making in connection with these risks, may not always be the correct ones. Why is this? At Lloyd’s, we believe that part of the reason is that companies are too eager to rely on public information. Too few are prepared to devote the necessary resources to their own research and analysis. For example, two-thirds of companies use international media as a source of information on the political risks they encounter around the world, while fewer than half use local media or have a mechanism for employees to feed information they have learned into risk analysis. This is despite the fact that someone working long-term in a volatile region often knows more about what is going on than an international reporter who jets in and out. Moreover, only one in five companies seeks out specialist information on these risks, for example through private consultancy, academic writings or NGO reports. The latter two can even be free. As a result, too few businesses are properly thinking through the risks and scenarios their own business faces. This can all too easily lead to a flawed perception of risk as well as causing business leaders to decline valuable investment opportunities in new markets for the wrong reasons. Another factor is that many companies are not taking the basic steps to prepare for terrorism risk at home. A quarter of global companies still don’t have a formal business continuity plan in place. Moreover, of those that do, too many fail to test their plans regularly or upgrade them to take account of changing risk levels. Greater recognition amongst business leaders of the changing risk environment is certainly good news. But business leaders need to invest in greater research and analysis and better business continuity testing at company level, in order to be confident of understanding and responding to terrorism and political risk. New areas of risk are emerging Next, a number of new areas of terrorism risk are emerging, which business leaders may want to consider. First, global concerns about energy security have brought to the fore the issue of supply-chain risk. Around a quarter of large companies think an attack on their energy supply is now a significant risk for their business. The wider issue is this: in an increasingly complex and interconnected economy, the risks of companies you do business with are now your risks too. A disruption of operations further down the line on which you are dependent has the ability to cripple your business. Lloyd’s underwriters advise that while supply chains cannot be fully covered against losses from damage to infrastructure that firms don’t control, businesses can take important steps to understand the critical dependencies better and make their processes more resilient. Technology provides another area of emerging risk. Until recently, cyber-terrorism sounded like the stuff of science fiction movies. But then in Estonia this May, a series of attacks on the country’s critical national infrastructure left banks immobilized for three weeks. This was a powerful piece of organized political violence and at the height of the attacks, 20,000 networks of compromised computers were being manipulated. While attacks like this may be rare so far, this is a risk, which many companies believe is going to rank higher on the boardroom agenda in future. Moreover, there is no doubt that today’s violent groups are adept at using IT for networking and recruitment, and for money-laundering activity. Perhaps unsurprisingly therefore, our research found that over four in 10 respondents have increased IT security in recent years in the light of the threat from terrorists. Overall, there are a host of good reasons to invest in IT security and while terrorists or other violent groups may not alter significantly the kind of risks or solutions needed, investment to ensure that company information and systems are secure is probably money well spent. Third, 21st-century terrorism means thinking about the worst, including potential chemical, biological and even nuclear outrages. A fifth of global companies—and a third of larger ones—now cover this threat in their continuity planning. But is this thinking premature, or does it indicate forward-looking risk management thinking? Evidence suggests that al Qaeda has a serious interest in acquiring such weapons, although it would be alarmist to suggest the threat is necessarily imminent. At the same time, in the last five years, in both France and the U.K., plots to engage in widespread ricin poisoning have been foiled by police. Prudence, not alarmism, therefore suggests that business leaders should consider the risk of such attacks, especially where the technology for them already exists. Terrorism is a threat, which is here to stay Finally, we need to recognise that terrorism is a threat, which isn’t going away any time soon. Walter Laqueur, Professor of International Security Studies in Washington DC, puts it like this: “Terrorism is relatively cheap and will be with us for as long as anyone can envision.” In particular, the rise of home-grown terrorism with a jihadi ideology seems to have taken society by surprise. In fact, at both our recent terrorism conferences in London and New York, around nine in 10 business and insurance professionals said that they see home-grown terrorism as a significant threat for the business community. And worryingly but perhaps unsurprisingly, they say they don’t understand the impact it might have on their organization. It is alleged that in a 2004 Internet posting, al Qaeda named Canada as the fifth-most-important target after the United States, Britain, Spain and Australia. And in May last year, CSIS Operations Director Jack Hooper said that terrorists born here in Canada represent a national security threat equal to that of terrorists from outside the country. We face a struggle to regain a lost generation. And this generational struggle is one which we can only win by co-operating together—government, business and wider society. Long-term threats require well-thought-out, long-term solutions. From an insurance perspective, this often means having a formal public-private partnership in place to provide businesses with coverage against the risk of terrorist attacks. Britain has had such a partnership in place for decades, where the commercial insurance market participates in a pool scheme with the government acting as the ultimate reinsurer if the loss is very severe. Other economies such as South Africa and Spain have had similar pools for a long time. More recently Australia, France, Germany and the U.S. have developed their own schemes to deal with terrorism’s more extreme impacts. Needless to say, Lloyd’s is an active participant in many of these, but Canada is noticeably alone amongst the world’s leading western nations in not having a terrorism pool in place. Long-term thinking is also a must for business at the individual level. Although governments are doing much to tackle the threat, they cannot do everything by themselves. And like it or not, business is perceived as part of the problem and needs to be part of the solution. The corporate sector can do much to drive engagement between wider society and communities whose young people are the most vulnerable to extremist ideology. Organizations also have much to gain by being good neighbours overseas too. Most businesses have traditionally tended to stay invisible in times of violence, but a growing number of experts now believe that business can play a more active role. Whether at home or abroad, this does not mean trying to solve political problems so much as driving economic development in ways which can help deliver a more stable operating environment and improved community relations. In conclusion ladies and gentlemen, the terrorism risk for business is real, and the majority of executives believe that the risks will increase worldwide over the next five years. • Business is now as much at risk as government, and Canada is no exception. But investing resources to research and understand the risks and to establish and test continuity plans will help us come to grips with the risks we face. •	Second, new areas of risk are emerging which we need to anticipate and to which we must respond with supply-chain risk, cyber-terrorism and even chemical and biological terrorism at the top of the list for consideration. •	Finally, whether we like to admit it or not, terrorism is a risk which is here to stay, so our strategy to counter it both at home and abroad must be long-term too. With the right planning and consideration, businesses can become even more resilient and adaptable so they can cope with both the threats and opportunities, which come their way. And Lloyd’s, with 75 years of experience helping Canadian companies manage and mitigate their risks, will remain a loyal partner in helping them face the future. Thank you for listening. The appreciation of the meeting was expressed by George L. Cooke, President and Chief Executive Officer, The Dominion of Canada General Insurance Company, and Past President, The Empire Club of Canada.